Holi is just around the corner, if you're looking for holi shayari and wishes to share with your friends and relatives then you're at right place. 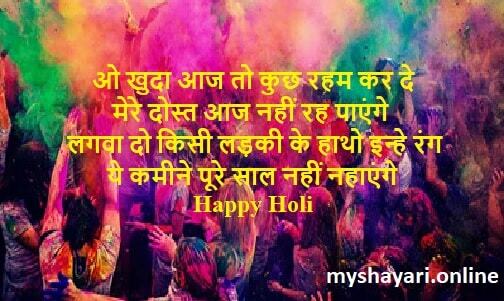 Here we have posted various holi shayari so you can wish on this auspicious day. You can post these hindi shayari for holi on your facebook profile and share with your friends and tag them. You can also set them as your whatsapp status and facebook stories. Wish your friends via SMS or via any messaging app on this holi. आप सब को मेरी तरफ से "हैप्पी होली"
So these were popular happy holi shayari, i hope you liked this, tell us in comments how was this collection. Read our other collections from our homepage. We will be updating our collections so stay tuned and bookmark this page.